Los Negritos (the Little Black Ones) are a legacy of the volcanic heritage of most of central and western Mexico. They are located a few kilometers east of Jiquilpan in the state of Michoacán. 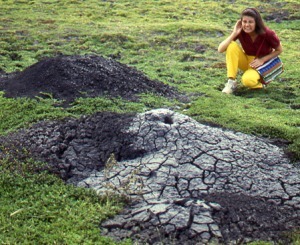 Two of the “Los Negritos” mud volcanoes. Photo: Tony Burton. All rights reserved. Los Negritos are small mud volcanoes (up to a meter or two across) which burble and gurgle, hiss and splutter, and occasionally erupt, throwing hot mud into the air and emitting sulfurous fumes. They are great fun to watch, but take care! Don̓t get too close or you may be splattered with the hot mud. Worse yet, you could step in the innocuous-looking but highly unstable surrounding mud patches which can rarely hold a person’s weight. 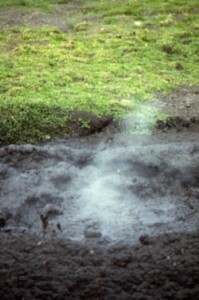 Other vestiges of volcanic action include several geysers, including the one at Ixtlán de los Hervores and the many thermal hot springs, now often utilized for tourist facilities and spas, scattered throughout Mexico’s Volcanic Axis. This is an edited extract from Western Mexico, A Traveler’s Treasury (Sombrero Books 2013). Mexico’s volcanic landscapes are discussed in chapters 2 and 3 of Geo-Mexico: the geography and dynamics of modern Mexico. Mud volcano puffs into action. Photo: Tony Burton. All rights reserved.